This was a scam, of course. “What do I need to do?” I responded, curious what might come next. Hon Thomas Smith responded within a few hours, this time from australia@immigrationsection.com.au.pn. The miscreant requested that I submit a scanned copy of my travel passport, a recent photo and my phone number. In addition, I was to email a scanned white paper sheet with my fingerprints on it. 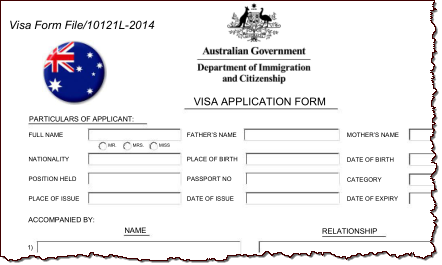 The email message included a PDF attachment that claimed to be Visa Form File/10121L-2014, which requested details such as date of birth, mother’s name and address. The PDF file didn’t have an exploit, as far as I can tell, and was merely designed as a place where the scammer’s target could conveniently provide personal information. The scammer was pursuing this information probably with the goal of performing identity theft. Also, future interactions with the scammer would probably include a request for money to process the bogus application. The domain from which the scammer sent the application, immigrationsection.com.au.pn, is considered malicious by some security companies, according to VirusTotal. It redirects webs visitors to www-dot-popnic-dot-com, which some sources consider malicious. Popnic-dot-com seems to be a front for Unionic-dot-com, which provides free domain registration, email forwarding, web hosting, URL forwarding, etc. under unusual TLDs such as .tc, .mn, .ms and others. More specifically, it offers registration under second-level domains that resemble TLDs assigned to major countries such as .uk.pn, .us.pn, .ca.pn, .au.pn, and others. No wonder it’s attractive to scammers, who want to get a domain that at a first glance seems legitimate. With the increasing variety of TLDs available, scammers will have an easier job selecting domain names that catch the victims’ attention or evoke trust. Regardless of the domain used by the sender of the email message, if the offer sounds too good to be true and involves supplying sensitive information, it’s probably a scam.